Rigbuilders face multiple headwinds; shipbuilders at the darkest before dawn? Spurring new wave of M&A. Prolonged oil slump, customer default and macro turmoil pose risks to the sector. Prefer shipbuilders to rigbuilders; top pick is Yangzijiang.  Lower-for-longer oil price is a drag on O&G players. OPEC’s reaffirmation of market share strategy and abolishment of official production ceiling in its Dec 4th OPEC meeting dampened sentiment further, sending prices to US$40/bbl levels. Oil prices are expected to remain volatile and average US$50-60/bbl next year similar to 2015 levels as OPEC continues to pump at a record rate and the anticipated decline in US shale production would be net off by the incremental Iran supply. Supply/demand equilibrium is unlikely to be restored till 2017, at the earliest.  Rigbuilders remain in the doldrums. Rigbuilders could be facing a multi-year downturn. The low oil prices and capex cuts by oil majors add to the woes of rigbuilders that were already struggling with a slowdown in orders amid rig supply glut with rising deliveries and keener competition. These have led to 20-30% declines in day rates and utilisation of drilling rigs, lifting deferment/cancellation risks and dampening newbuild demand. We expect order wins of Singapore rigbuilders to decline from S$9-10bn to S$5-6bn p.a. in 2015-2017, leading to a downtrend in orderbooks and earnings.  Shipbuilders on the bumpy recovery path. The shipbuilding sector has gone through two mini-cycles post GFC. Ordering activities have slowed from 2013 peak, down over 20% y-o-y in 10M15 and newbuild prices have also softened by c.5% amidst depressing shipping market. Looking into 2016, ordering activities could slow further after the wave of ordering for large oil tankers and mega containerships in 2015, but newbuild prices should stabilise at current low levels. The saving grace is that orderbook-to-fleet ratio has moderated to a reasonable 20% and yard overcapacity has shrunk with massive yard closures and consolidation. 2016 could be the darkest before dawn as more yards go belly up, setting the stage for recovery beyond 2016.  Sector consolidation goes on. Speculation rife on mergers of big yards, marking the final leg of sector consolidation – Chinese CSSC and CSIC; Singapore Keppel O&M and SMM; Korean DSME and Samsung. The phase-out of uncompetitive small yards and mergers of big players should eventually accelerate the sector's recovery.  Prolonged dip in oil prices. Further capex cut is expected in the event oil prices sustain below US$50/barrel, and if the global economy dives into an unexpected recession.  Risks of default payment and deferment. While Singapore rigbuilders have a strong clientele, we see heightened default / cancellation risks from some of the smaller and opportunistic customers in a low oil price environment. For shipbuilders, recovery can be bumpy as freight rates can be volatile and risks of bankruptcies in shipping companies remain, though lower than previously.  Financing constraints could affect order momentum. Financing institutions might be more prudent with their lending to O&G companies following the recent oil price weakness. Potential funding constraints faced by customers as a result of lack of financing options and/or higher funding costs, which could impact order momentum.  Asset deflation and margin contraction. Newbuild prices are set to fall given the drop in material cost, and potentially low-balled pricing with the dearth of new orders in an attempt to keep yards busy. This might also be exacerbated by fire sales triggered by desperate owners/shipyards on the verge of bankruptcies. As a result, margins could normalise further.  Prefer shipbuilders to rigbuilders. We believe stock performance of rigbuilders would be overshadowed by oil price uncertainty in the next 6-12 months. A shortterm reprieve may be seen if oil prices rebound, but excess rig supply will take a while to be absorbed. The surviving shipbuilders will benefit from ongoing consolidation and hence, we advocate investors to bottom-fish good yards with proven track records and strong balance sheets. Our top pick is Yangzijiang (TP S$1.55), one of the most well-run and profitable Chinese yards and beneficiaries of sector consolidation. Its valuation is undemanding at < 7x PE and 0.8x P/BV despite offering 4-5% dividend yield and 12% ROE. We reiterate our BUY call on Sembcorp Industries (TP S$3.80), where earnings are relatively more resilient as 60% of its profits are from Utilities and is not affected by changes in oil prices. We believe its current low valuation of 0.8x P/BV, dragged by bleak marine outlook, is unwarranted as SCI offers 10% ROE and 4% yield. We have HOLD ratings on Keppel (TP S$7.40), FULLY VALUED call on Sembcorp Marine (TP S$1.85) and Cosco (TP S$0.32). 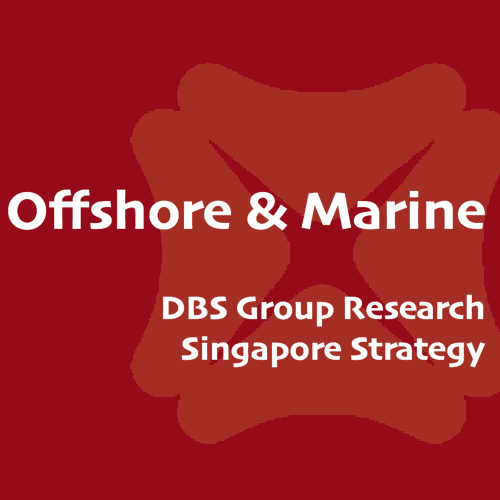 While valuations of Singapore rigbuilders are appealing, we expect the offshore sector to get worse before it gets better, and no clear re-rating catalysts in the near term.